Think Mongolia is technologically challenged? Think again, rocket scientists. They’re jumping all over the Internet and the authorized Apple reseller in Mongolia, MCS Electronics, also happens to be one of its hip ISPs. They’ll be selling iPads in no time via their IT Zone shops. What do they use to hook up their customers across the vast Asian steppe? Satellite, of course. They’ve got their own teleport and they’ve just signed up with Canada’s Telesat for a chunk of space on Telstar 18. Telesat, the world’s fourth largest fixed satellite services operator, announced today that Orbitnet LLC of Mongolia (ORBITNET) has signed a multi-year agreement for Ku-band capacity on Telesat’s Telstar 18 satellite. ORBITNET is a leading provider of advanced Internet solutions in Asia and is using Telstar 18 to bring broadband connectivity to business, government, and cellular operators in the region. "Broadband satellite services combine the reliability, high speed and cost effectiveness that make them an ideal solution to meet the growing needs of developing Asian countries like Kazakhstan and Mongolia," said Sukhbaatar Pagvajav, Technical Director of ORBITNET. "Our company began using Telstar 18 in 2008 and our customers are very impressed with the quality of service we have been able to deliver. 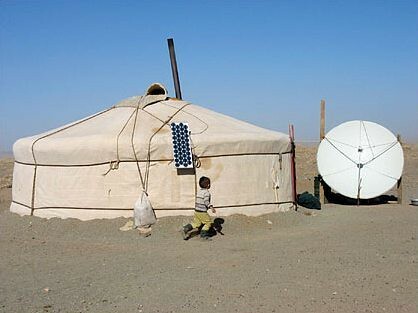 ORBITNET’s business in Mongolia is going well. We have expanded into Bhutan and Kazakhstan and look forward to bringing broadband satellite services to more countries in 2010." "The coverage and capabilities of Telstar 18 are ideal for meeting the needs of Asian broadband providers like ORBITNET," said Nigel Gibson, Vice President, International Sales for Telesat. "Telstar 18 is one of the most versatile satellites in the region with C-band that connects Asia to the Americas and Ku-band to serve video broadcasters and broadband networks. We see good opportunities for continued growth in Asia with Telstar 18." Typical customer quote, followed with a happy quote from the guy who gets the commission. This entry was posted on Thursday, January 28th, 2010 at 6:52 am	and is filed under Astronomy, Observation, Rockets & Launches. You can follow any responses to this entry through the RSS 2.0 feed. You can leave a response, or trackback from your own site.